Wild Mountain is the place for your children to explore Sierra's winter wonderland! From Adventure Zones to terrain parks, your children will have tons to cheer about. Our instructors have the training, personality and patience to get kids out on the slopes and keep them smiling. Our programs are categorized by age and ability level to ensure your kids get the most out of their mountain experience! The Pioneer learn-to-ski program is aimed at 4-6 year old children. In order to help develop their mountain skills and get the most enjoyment out of their skiing experience, the lesson combines off and on snow activities geared towards helping children understand the fundamentals and discover a passion for the sport. On week days Ski & Snowboard School Opens at 8:30am. On weekends and during holiday periods we are open from 8:00am. We strongly advise that you aim to arrive, at the parking lot, at this time to allow for sufficient time to register and prepare for the lesson. Parents will be responsible for taking their kids through the registration process. Drop off is right after registration and up to 9:00am. Ski & Snowboard School employees will be responsible for your child from them on until the end of the day. Your child must be registered and dropped off before 9:00am in order for them to participate in the full program. During this period all children are fitted with equipment for the day. This includes a combination of indoor and on snow ski/snowboard related activities continuing their adventure by introducing the physical aspects of the sport. Children with prior on snow experience are assessed and higher level classes will head out to explore the mountain. Throughout the morning, healthy snacks and adequate break time is included to keep kids interested and energized. Children enrolled in the Full Day program will eat lunch at Wild Mountain. If your child has any specific dietary needs such as gluten free, celiac, or vegan we kindly suggest you bring their own lunch. Children in Full Day and Afternoon lessons are ready for pick up in the Corral. Your child's instructor will be available should you have any questions. Wild Mountain Closes. (4:30pm weekends and holidays) Check availability for the following day and make a reservation. Pick up time is at 3:30. We allow a 15-minute grace period after which a late fee applies. From 3:46pm – 4:00pm a $40 late fee will be charged per child. At 4:00pm and every 30 minutes thereafter a $50 additional charge (per child) will be applied. Parents... Remember that a good night's sleep, a hearty breakfast and plenty of fluids will help keep your child energized and active. In case we need to contact you, the Ski & Snowboard School will use the contact numbers you provided during registration. Cell Phones have limited coverage at our resort; please check your messages throughout the day. Please also periodically check the message boards located at the base of the lifts and in the base area. If your child's name appears here contact us as soon as possible. For the safety of your child, parents MUST remain on the premises. Please be sure to inform us if your child has any food allergies or dietary requirements. Children with allergies or dietary restrictions are welcome to bring their own lunch to be stored by the staff. However, lunch cannot contain tree nuts or peanuts due to our health policies. The Wild Mountain staff is not authorized to administer medication to children. For your child's safety, when picking up your child, you MUST have the pickup slip that was given to you at the beginning of the day. If you misplace the slip, please contact the Ski & Snowboard School prior to the scheduled pickup time. At the end of the lesson your child will receive a report card detailing what they learned and what level they should enter into should you choose to return. 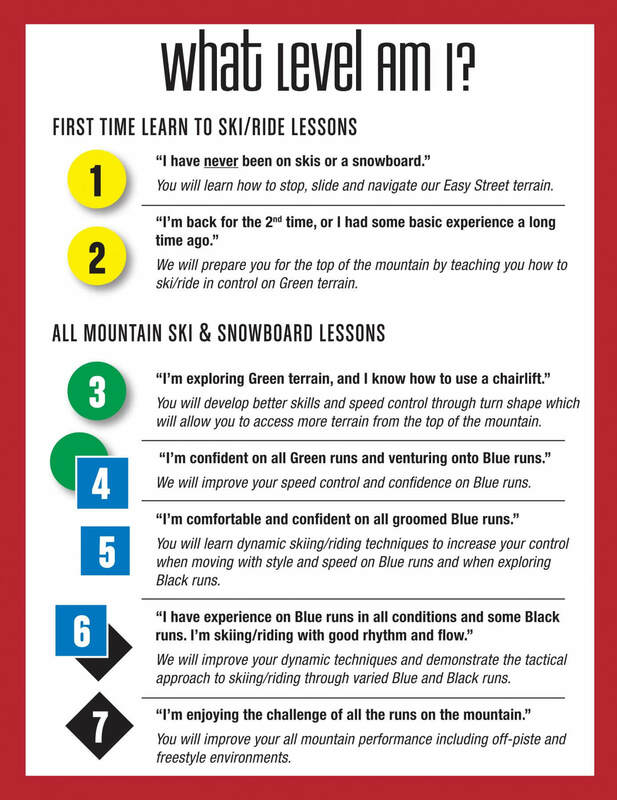 Bring your report card next time to help us learn a little more about you and your skiing/riding! Children should arrive, dressed in layers, ready to ski or board. This includes: waterproof pants and jacket, warm socks, waterproof mittens, goggles/sunglasses, sun block. Retail items are available at the Wild Mountain Ski & Snowboard School. Helmets and ski pants are available for rental. To ensure a smooth check-in process, we suggest arriving to the mountain an hour before your child's lesson time. Purchase lesson packages and tickets at the Learn to Ski/Ride building or online below. *3-PAK + 10-PAK Reservation Request: Please note this is only a reservation request and you must already have a purchased 3 or 10PAK program for the current season. Your lesson will be confirmed via email. Reservations must be made at least 24-48 hours in advance. Walk-ins may be available and start at 8:00 a.m. on weekends and 8:30 a.m. weekdays. *The 3-PAKs and 10-PAKs are valid for any three days or ten days of the season, including holiday dates, and dates do not need to be consecutive. Non-transferable. Non-refundable. Afternoon lessons are based on availability. If you haven’t already made a reservation online, to save time, please call 530.543.3150 to make your reservation 48 hours prior to your arrival. We recommend you arrive by 8:30 a.m. (8:00 a.m. on Saturdays and holidays) to allow for ample time for the check-in process. The check-in and registration process for full-day and morning classes ends at 9:00 am sharp. One adult must remain present at Sierra-at-Tahoe throughout the day in case of emergency. Dress child appropriately for the weather. Layers are best. Be sure your child has eye protection (goggles for snowy days and sunglasses for sunny days). Hats, gloves, sunscreen and other items you might forget are available for purchase at the Wild Mountain Children's Center. Helmet rentals are available at the Wild Mountain Children's Center. Be sure your child eats breakfast. Lunch is included in all full-day programs. If your child has any food allergies or special diets other than vegetarian, please provide your child a lunch. Absolutely no peanut or nut products can be brought from home. Your child will be placed in a group according to their age and ability level. Although you will make a preliminary assessment, final placement is determined with consideration toward the safety of your child and other class members. Adult lift tickets can be purchased at Wild Mountain Children's Center. The 3-PAKs and 10-PAKs are non-transferable and non-refundable. Is your child ready for ski/board school? Is your child ready for a full day of skiing? Our Ski Program can be a fun filled experience for children. However, it can also be a demanding day both physically and emotionally for some children. Please read through the below characteristics to help you decide if a day in ski/snowboard school is the right option for your child. Children who exhibit most of these behaviors may be ready to learn to ski or snowboard. Please remember that all children MUST be fully potty trained to attend ski/snowboard school. If this sounds like your child, we invite you to check out the program itinerary. If you have concerns or feel unsure whether the program is suitable for your child, please check out our licensed day care center or feel free to come and have a chat with us.